Independent Birmingham were celebrating the 2nd birthday of their discount card. Marmalade (part of the Bitters ‘n’ Twisted group) were their latest addition and hosted a free BBQ to commemorate the joint celebration. I thought I would pop along and see what was on offer. 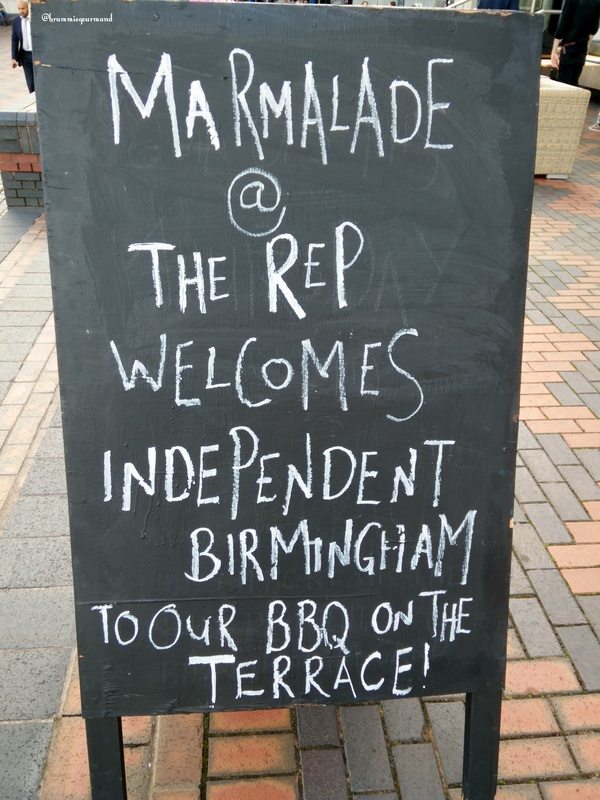 As a fan of both Independent Birmingham and Marmalade, it sounded like the perfect combination to me. Independent Birmingham promotes the best of the city’s up and coming bars, restaurants and shops, away from the usual national chains and corporations. Their discount card is partnered with over 70 of the city’s unique independents and local chains. Marmalade is currently the eigth and latest endeavour from Bitters n Twisted and replaces the former Rep Eats! pop up, which in turn replaced Paul Welburn at Searcy’s since the refurbish in 2013. With a funky 70’s style interior to match the building it’s hosted in. It provides pre-theatre food and cocktails for those visiting the Rep and nearby Symphony Hall. I have previously eaten the pre-theatre menu and it’s a great deal, whether you’re seeing a show or just passing by. It was perfect British BBQ weather as a light drizzle set in upon my arrival. I went inside and got myself a beverage, Shipyard Pale Ale, to keep me occupied until the food was ready. I went for a beer as I was a little confused about the Cocktail Special offered at two separate prices! IB Card Cocktail Special! Reasonably priced at £5! IB Card Cocktail Special! Reasonably priced at £4.50! …wait …what? The sun poked its head through the clouds and I strolled outside to soak up the rays that were eeking out! It didn’t take long for the BBQ to get fired up, the queue quickly grew at the smell of cooked meat. The service was fast and it didn’t take long for me to get my hands on some meaty goodness! Vegetarians were also catered for with a halloumi burger. To accompany the burgers, a nice selection of nachos, sauces and side salad rounded out the offering. I grabbed some nachos, drizzled in cheese and salsa, and a few green leaves (to pretend to be healthy!). The burger was served in a nice brioche bun; it was thick, juicy and meaty, the burger relish had a spicy kick. The nachos were large, crunchy and were great with a generous dollop of salsa.